If you have a SKU in Zentail that uses a product ID that is different from the product ID found on your Seller Center, you may have encountered this Walmart error: "This SKU is already set up with a different Product ID (i.e., GTIN, UPC, ISBN, etc.). 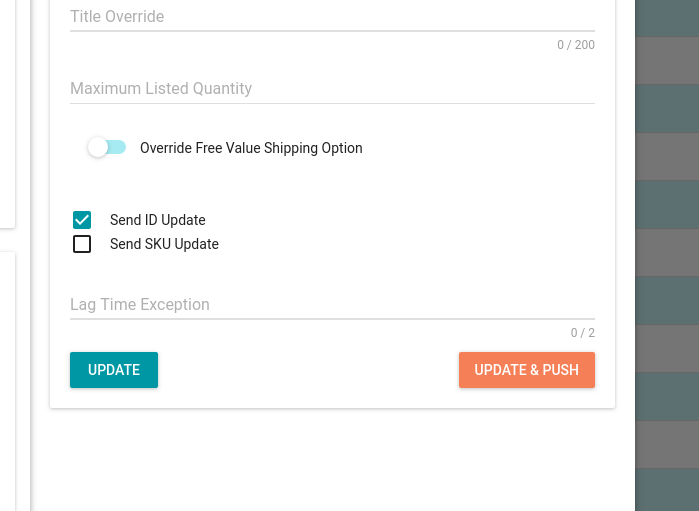 If you are trying to change this SKU's Product ID, submit the product_id_override flag in the request." Walmart requires you to upload a product ID override request directly on Seller Center in order to resolve this error and change the SKU's product ID. Now, you are able to do this in Zentail through the Walmart Product ID Override feature. Click Update or Update & Push. Once enabled, Zentail will send an update to Walmart to change the SKU's product ID (usually your UPC) to the value you have in Zentail, or to change the SKU for a product ID to this SKU!